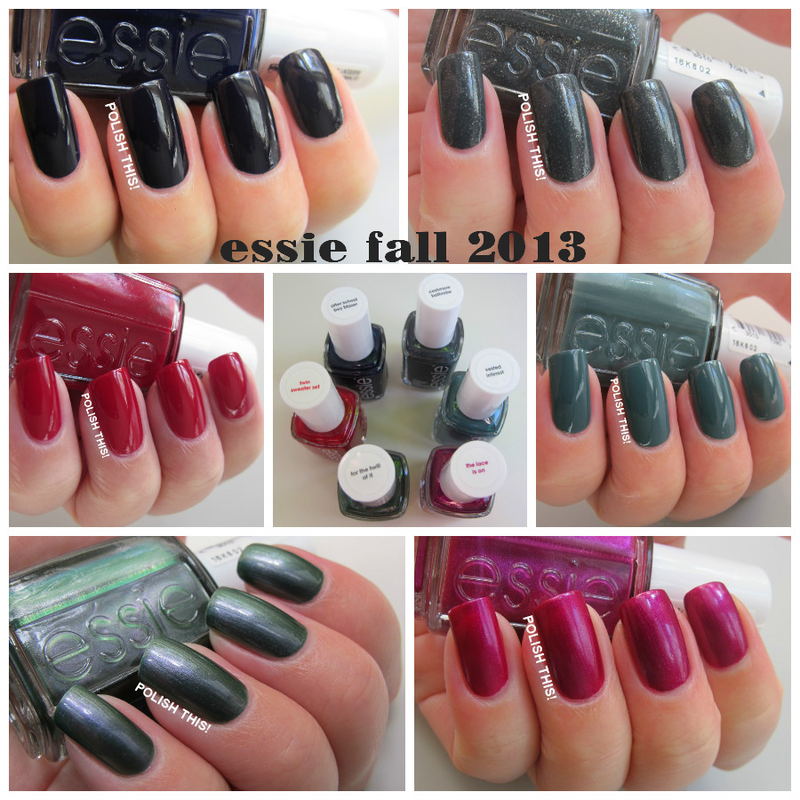 Essie Fall 2013 Collection: Swatches and Review - Polish This! 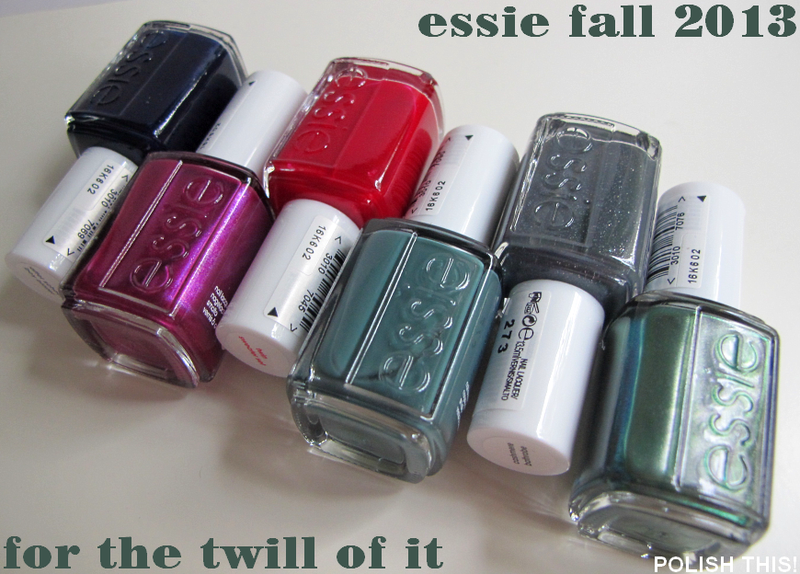 I finally have Essie fall collection to share with you guys! I know you have probably seen this already out there, but it just recently got in the stores here in Finland and I just got it from L'Oreal Finland for review. So I still wanted to share my swatches of this collection with you guys. The collection is called For The Twill Of It and as usual it includes six polishes. I think it has quite a good selection of different colors and finishes, but more on that later! Of course I also had to play around with the box as I just adore it! It's so cute, I can't really help myself. I wish all the polishes came in boxes like this or at least that you could buy these! 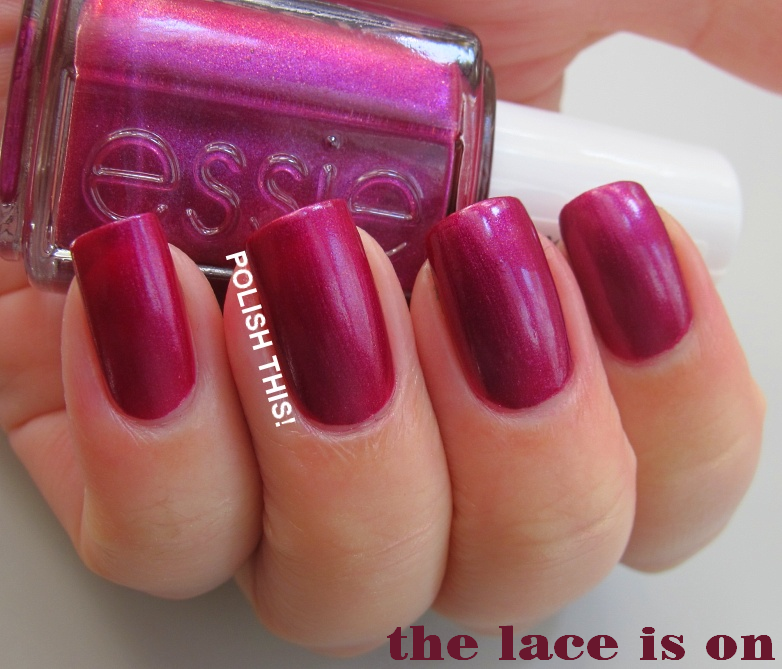 I used two coats for all these swatches and they all seemed that really great formula. These are all also without base or top coat if I don't state otherwise. 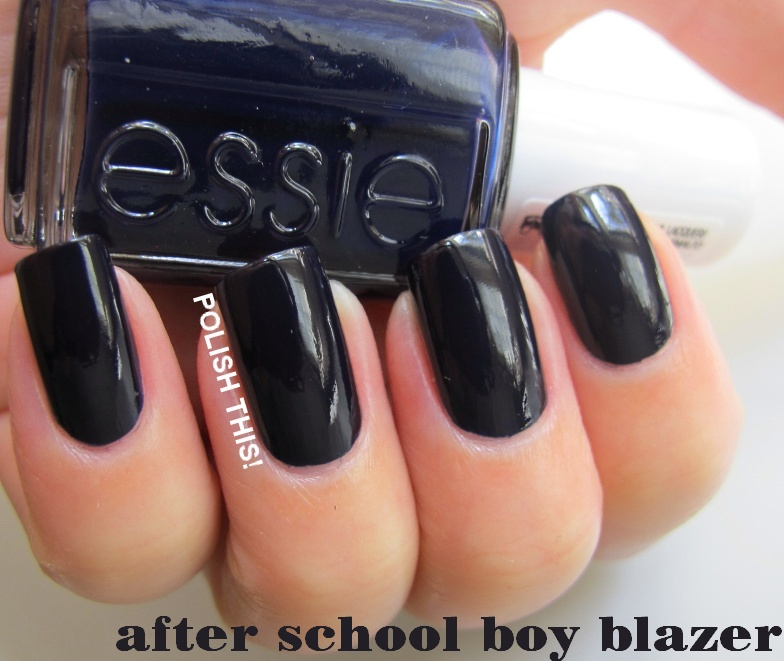 After School Boy Blazer is a very, very dark blue creme. It pretty much looks black in dim lighting and even in direct sunlight you have to take a closer look to see that it truly is blue instead of black. It's still a really beautiful color and the formula was spot on! It covered really well, you could maybe even get away with just one coat. Cashmere Bathrobe is a dark grey with gorgeous silver shimmer. The shimmer is similar to the five shimmery polishes from Essie's this summer collection and it's the type of shimmer that I really love. The formula was really great here too, two easy coats for full coverage. For The Twill Of It is the namesake of the collection and Essie describes it as rich maple with reflective olive shimmer but I'd say it's more a metallic grey multichrome that flashes purple/magenta and teal. It's also a dead on dupe to OPI Peace & Love & OPI, so if you have one, you don't really need the other. It's metallic, so it's a bit brushstroke-y but nothing too major. Again, the formula was really nice, two easy coats here, this time with base and top coat as I wore this as a manicure for a while. The Lace Is On is a really gorgeous fuchsia shimmer. I thought I might not like this based on how it looked in the bottle and in some swatches that I've seen, but this one is truly amazing color! It's impossible one to photograph as it literally glows on nail and that doesn't really transfer into pictures. The formula was again really great, very easy to work with. 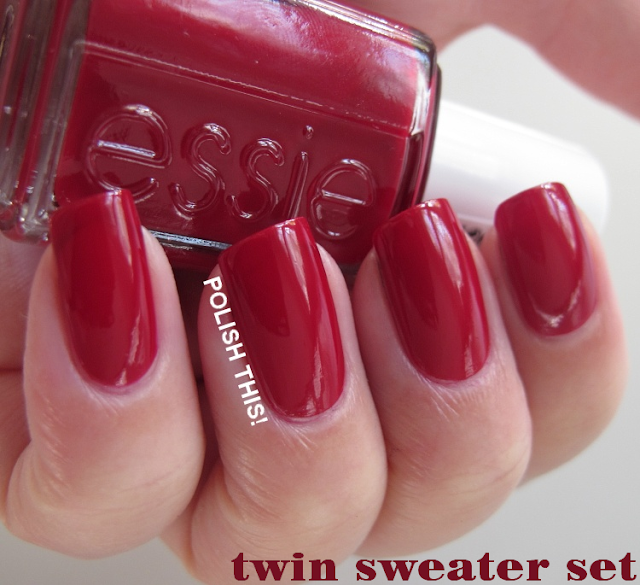 Twin Sweater Set is a crimson red creme. This was actually borderline crelly and with the first coat it looked quite jelly-ish but the second coat covered really well. In some light you can probably still see a bit of nail line though, so if that bothers you, you might need a third coat. Though I thought that the coverage with two coats was quite nice already. This was too really easy to work with, though you might need to be careful with the removal to avoid any stains around the cuticle area. 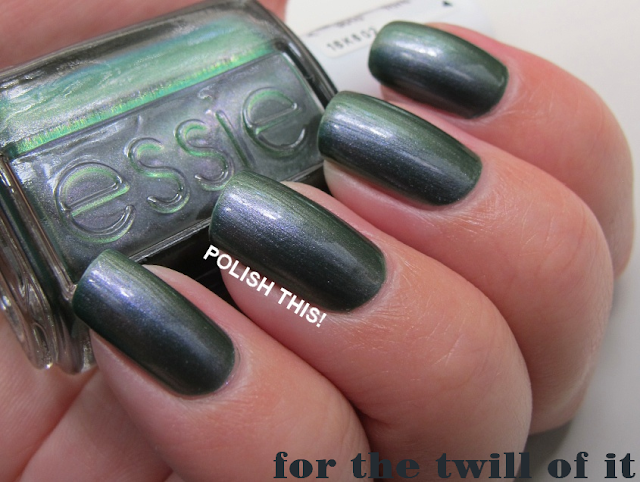 Last but not least is Vested Interest, a greyed green creme. 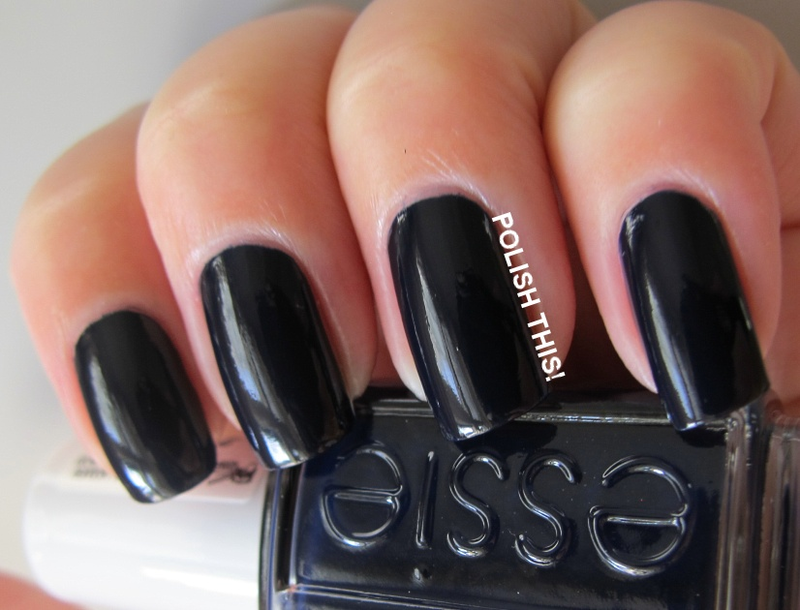 This is quite a dusty color and really gorgeous for fall. And as with all the others, the formula was again really nice and this was very easy to work with. My favourite ones of this collection were Vested Interest, Cashmere Bathrobe and surprisingly The Lace Is On. I really thought that For The Twill Of It would be my very favourite one, but somehow I didn't enjoy it on me as much as I thought I would. It's still a very gorgeous polish and if you don't have the OPI one already, it might still be a must-have. After School Boy Blazer and Twin Sweater Set are both really pretty polishes too, but not very unique ones. If you don't have similar colors already, then they might be worth of taking a look as the formula in both of them was really great. I think this was really a great fall collection and the colors compliment really nicely each other. Like I've said, the formula was really really great with all of these, so if you like the colors, I can sincerely recommend them all. So tell me guys, which one did you like the most? Kaikissa lakoissa on ihan huippuhyvä koostumus ja kaikki levittyivät vaivatta kahdella kerroksella. Toki näissä mun omissa on nimenomaan se leveämpi sivellin, joka tietysti helpottaa levittämistä, mutta sanoisin, että näiden kanssa pärjäisi varsin hyvin myös kapeammalla siveltimellä. Omiksi suosikeiksi nousi kaunis vihertävän harmaa creme Vested Interest, upealla hopeisella shimmerillä varustettu tumma harmaa Cashmere Bathrobe ja itselleni hieman yllättäen todella eloisa fuksia The Lace Is On (joka muuten ei näytä missään kuvissa niin hehkuvalta, kuin se oikeasti on!). Kokoelman nimikkolakka For The Twill Of It on myös upea lakka, tosin omilla kynsillä en tykännytkään siitä niin paljon kuin alunperin luulin. Lakalle löytyy myös vastine OPIlta (Peace & Love & OPI), mutta jos sitä ei vielä kokoelmista löydy, kannattaa ehkä katsastaa näistä ainakin jompi kumpi, sillä lakka on kuitenkin todella nätti, mutta molempia ei siis todellakaan tarvitse. Todella tumma sininen After School Boy Blazer ja karmiininpunainen Twin Sweater Set ovat molemmat myös todella nättejä lakkoja, eli jos kokoelmista löytyy vielä tilaa tällaisille sävyille, kannattaa nämäkin ehkä katsastaa, sillä koostumus näissä oli kuitenkin todella hyvä. Kannattaa kuitenkin huomioida, että After School Boy Blazer on todella todella tumma, eli valaistuksesta riippuen se näyttää useimmiten lähinnä mustalta. Kertokaas, mikä oli teidän suosikki tästä kokoelmasta? *Lakat on lähetetty minulle arvioitavaksi, mielipiteet niistä ovat täysin minun omiani. I want Cashmere Bathrobe and The Lace Is On. I saw these at the beauty supply store and they wren't anything special in the bottle so I didn't get a single one. Now after seeing swatches, I really like The Twill of it too and I might go back and get all 3. Both Cashmere Bathrobe and The Lace Is On really come to life on nail, so they really shouldn't be judged based on only bottles (or swatches). Especially The Lace Is On really surprised me when I put it on, so you really need to try it to really see how gorgeous it is. :) The Twill Of It is certainly also worth getting, it's really pretty and unique (well, if you don't count that OPI dupe). My favourite is The Lace Is On, hands down. It's utterly gorgeous. I originally bought Twin Sweater Set and Cashmere Bathrobe as well, but they both ended up in my to-be-sold -box - both were darker than I would've liked. Cashmere Bathrobe on kyllä ehdottoman nätti! Ja Lace Is On kannattaa todellakin katsastaa, tosin se ei välttämättä ihan pullossakaan paljasta vielä syvintä olemustaan. Kaikki se hehku ja kauneus tulee juurikin esiin vasta kynnellä ja se on oikeesti upea! This collection is really gorgeous. I love Vested Interest and The Lace Is On and I think I will wear them many times during autumn!